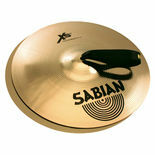 Sabian's new Brilliant finish XS20 Cymbal Series is truly a cymbal that no one else could make. 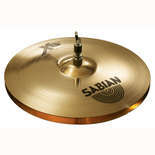 The Sabian Vault Team created the first and only mid-priced, high quality B20 bronze cymbal series that deliver the look, feel and sound of a much more expensive cymbal. This new XS20 Brilliant finish provides an impressive look that allows the natural high tones of the cymbal to cut through and project a clear, clean sonic property. Think about it, if you can get a better sounding, better looking cymbal for the same price, wouldn't you? 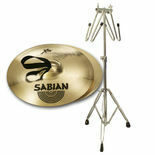 You can now do exactly that with the Sabian XS20 Brilliant Cymbal Series. This XS20 Brilliant Cymbal Series is available in a full line of sizes as well as value added pre-packs that are a perfect match for any playing situation. 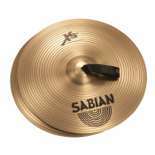 The Sabian XS20 Series of Concert Band Cymbals are now here! This pair of cymbals measure 16" and have a great sound for a budget price.